Note to self: if there are no sails, and the wind is blowing, but not toward where you want to go, do not entertain the idea that you can yuloh wherever you want! Rig the sails… Or stay put. Wait for glassy calm, and while you are waiting, rig those sails! Looking on the bright side, the most interesting thing about “motorless” is the opportunity to further develop one’s judgment, by collecting completely new experiences. I’ve never claimed to be a fast learner – I’m just determined. Each new set of circumstances has so many intriguing, and significant, factors. 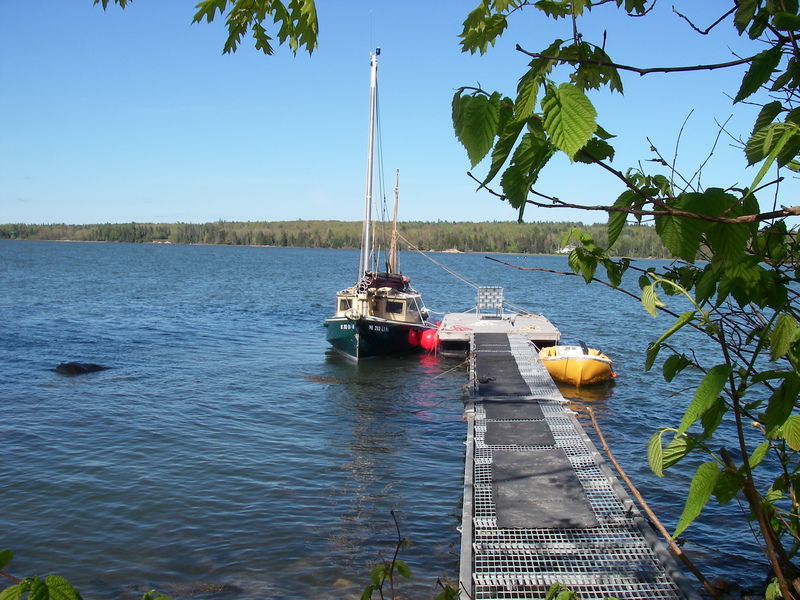 The new circumstances these days have to do with both launching the boat motorless, and being the proud keeper of a mooring that is close to 1/2 mile from our shore. The distance has to do with the location of the channel, and the substantial mud flat at low tide, that leaves everything but the channel high and dry (or muddy) when the tide goes out. It’s a bit of a task, to get back and forth across that distance. The right answer in this combination of new circumstances would have been to work on rigging the boat on the mooring, and then to go back to shore (before the tide went out) with the dinghy that got me and Suzanne out there in the first place. Instead, I had the idea that it would work to bring AUKLET back to the float under yuloh power, to do the rigging more conveniently where one could climb around, on and off the boat itself. 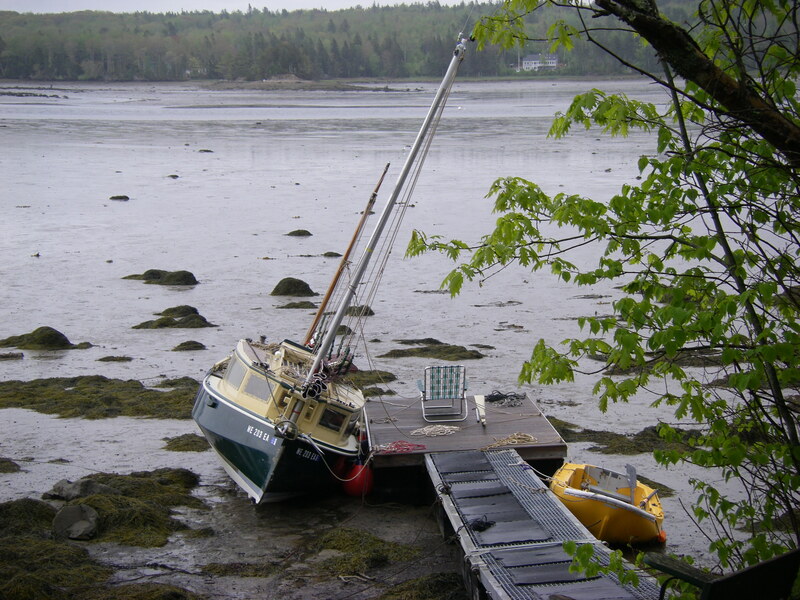 Now that the storm of the other day had passed, the boat would settle just fine in the mud at low tide alongside the float, being both accessible and easier to work on. With this in mind, as the afternoon breeze died back we let go the mooring and AUKLET headed for shore, with the dinghy in tow. In a flat calm, propelling AUKLET by yuloh is both pleasant and effective. The boat moves along well enough for good steering with the tiller and makes quite reasonable progress. Somewhere in the range between glassy calm and larger wavelets there is a transition from easy and pleasant to difficult to steer. Some wavelets/wind is doable; then there’s a crossover point, beyond which the wind catches the high bow and cabin, making any steering a compromise at best. The other day I was reminded about all of that, as instead of dying back further the breeze strengthened when we were halfway across that open expanse between the mooring and our float. Headway was slowed, steering diminished, and there was no turning the bow the 20° closer to the wind that would have put us back on course. This reminder of yuloh and steering limits led to an evening on the shore, about 450 feet downwind of our destination, in spite of all our best efforts. As the shore got closer, and being too far downwind, we anchored. Scrounging around, Suzanne and I tied together every spare line on the boat, and then dinghyed toward the float, running out of length about 100 feet short of the goal. We retrieved some extra line from the float, and led it back along the shore to where the dinghy had stopped. Altogether, with one long pieced-together mish-mash laid out between boat and float, we were eventually in position to pull the boat upwind to its berth. Did I mention the tide was falling? 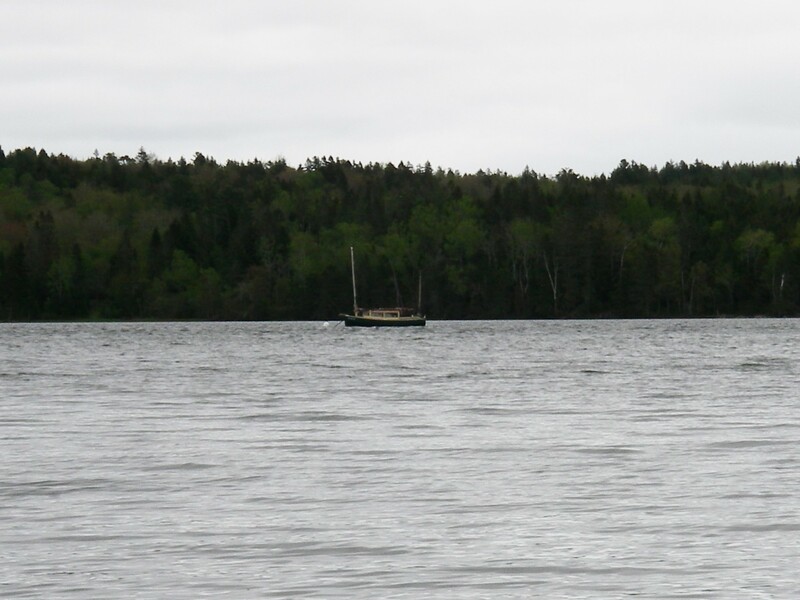 After hauling the anchor back up, and pulling on the long line toward the float, that same breeze pushed the boat into the shore, where with very little ceremony it was soon contentedly stuck. Using the dinghy, we put the spare anchor out in deeper water, so that when the tide came back it would be possible to keep the boat off the shore (it would have been handy to have done this earlier). 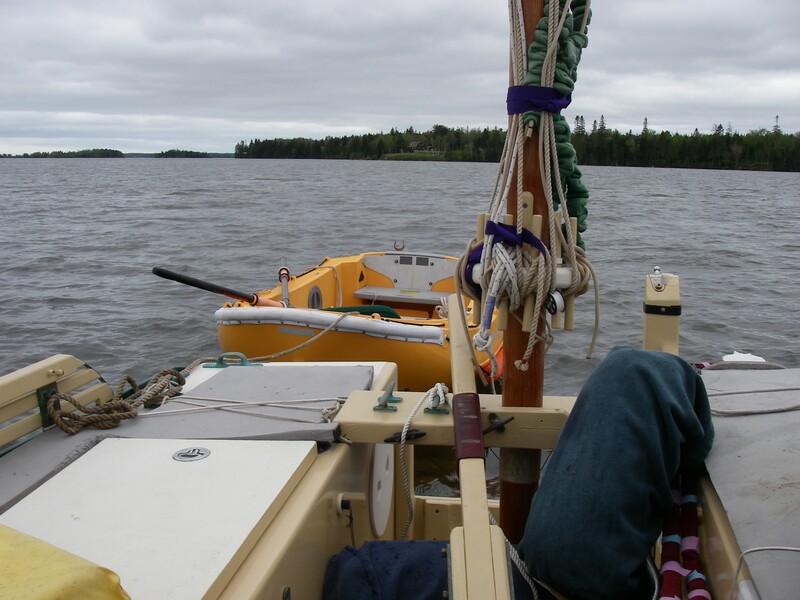 We adjusted our patchwork line to the float, and settled in, putting our weight on the shore side of the boat so it would go down in that direction, happily observing that it would be a soft landing on mud and grass. The neighbors came to visit, checking that all was okay, and it was an easy walk on the now-drying shore between the boat and our house. 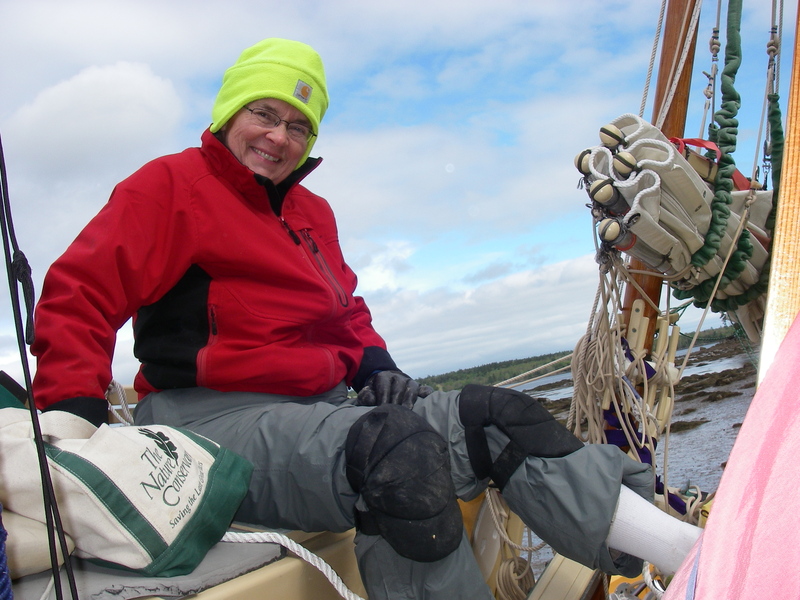 I stayed with the boat, Suzanne went for supper, returning with a delightful thermos of hot food, and we counted out the calculations for when the water would be back. On the theory that there was no reason whatsoever for both of us to spend all those hours in the fun-house angles of the beached boat, Suzanne went back to the house for a nap, and I settled in to the low side of the cabin to do the same thing. Sometime around 11 or 11:30 that night the boat would be floating again, ready to pull to our original destination. What a production! 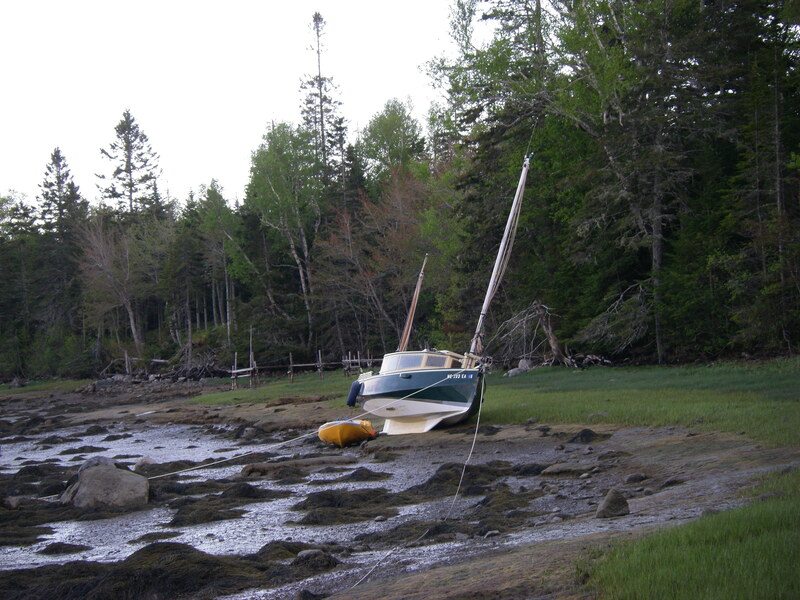 The anchor line for keeping the boat off the shore was rigged with a buoy – really, a spare fender – so that it could be let go in the night and retrieved at another time. We agreed on a flashlight code (one flash for “pull,” two flashes for “stop pulling”) and that I would call on the cell phone when the boat was floating. 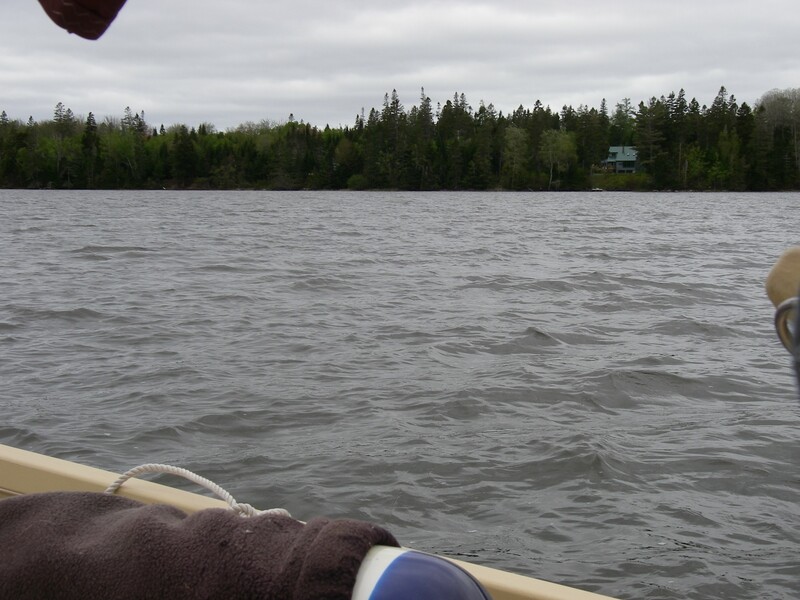 Suzanne asked how I would be sure to wake up, and I responded confidently that I never sleep through the boat starting to float, because it is both noisy and jouncy, with small creaks and slapping water noises, and shifts of position as the interior of the boat comes back to horizontal. At five minutes to midnight, there I was sound asleep, awakened by the ringing telephone. Thank goodness! With the boat not completely outfitted, I had no alarm clock. The night was perfectly flat calm, and I had slept soundly right through the boat coming up! Fortunately Suzanne had woken up at 10:30, and had been waiting, ready to go. On the one hand, that was a long wait. But on the bright side, instead of rushing our trip across barely submerged rocks, the tide was now an hour before an astronomical 13.6′ high, with the water deep, and perfectly still. Stars reflected on the glassy surface, and what had been so hard, and impossible, in the afternoon, was now an easy, relaxed pull on that long line, gathering it in as the boat moved quietly through the moonless but starlit dark. In the end we used no flashlight signals, and were soon near enough to talk softly, hoping not to wake the neighbors. The anchor line out to deeper water was unneeded, and after it was stretched out the fender/buoy went over the side, to be picked up in the daytime. Moving the boat took about ten minutes, with everything laid out and the water so peaceful. After AUKLET was tied alongside the float, including lines from the masts to make sure that the boat would lean toward the float when the tide went out, we spent a little time admiring the stars, and said goodnight. I stayed on the boat, to make sure that it would go down okay when the water left again around 0430. 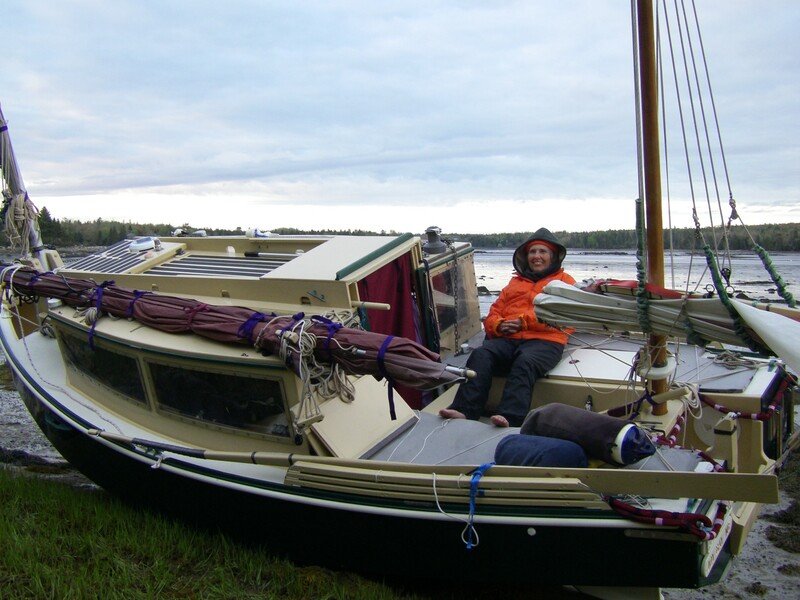 It was chilly – 37° that night – but satisfying to sleep on board with the boat properly snug. Informative and entertaining. Clever extrication maneuvres! Now I understand the utility of bilge keels on British boats that are used mainly in estuaries and other areas of broad mudflats: keeps them upright at low tide. Looking forward to a sailing report soon! Greetings, Helen! Yes, bilge keels would be very welcome. Although it’s rather nice to be able to step right off the side of the boat, when it is down like in those photos. Still, it would be worth using a ladder, to have everything right side up with the tide gone out! When the weather warms up a little more, will you be out in your little yacht? Having gone through this experience with Shemaya, I can report that she makes a great captain. As this adventure was unfolding, I could feel myself a couple of times wanting to panic. Shemaya remained calm and methodical, stating clearly what we needed to do. Because of her manner, I was able to remain calm, despite my inner “C3PO”. Thank you Shemaya! Thank you so much for the lovely feedback. Although I had something smoother in mind, we did indeed have an adventure. Those quiet stars were rather worth it, C3PO and all!